Oscar lost $58 million in the first half of 2017. This after having lost $83 million in the first half of 2016. Looks as though their BCR in California and Texas is under 100%, which is a good sign for them. And that’s about half their membership currently. Will be curious to see how their small group sales is going. Must be nice having venture investors that back a long term vision. Link. Artemis Health raises $16 million Series B. They’re providing data analytics on claims for self-insured employers and linking that to specific actions for high cost areas. Link. CMS has cancelled Episode Payment Models and Cardiac Rehab Incentives. Link. Sometimes I don’t understand things — joint replacement surgery costs were down $5,000 per episode. Link. Execs are getting asked on their quarterly conference calls about their Amazon strategy. Pretty amazing the impact Amazon has on an entire industry just by saying they’re starting to think about it (now lets see what they actually do) Link. Aledade is expanding beyond Medicare, but isn’t yet generating meaningful revenue from shared savings arrangements. Aledade is up to some cool stuff and the NYT noticed. The article doesn’t share a ton of new info, but is a helpful overview of Aledade. The last few sentences are interesting though — they didn’t realize enough savings in year 1 to generate any meaningful revenue (they generate revenue through cost savings on Medicare patients). Link. There have been a few notable departures from CMS recently, including Dr. Patrick Conway and Seema Verma recently, which lend some credence to the thought that Tom Price is backing off the moment to fee for value. Link. Apple & Aetna had a group of digital health folks to LA recently to discuss the Apple Watch partnership. Seems like it was a fun time. Link. Another take on CMS’s decision to cancel bundled payment programs. Also talks about Conway’s departure as a sign the administration is moving away for fee for value. Link. 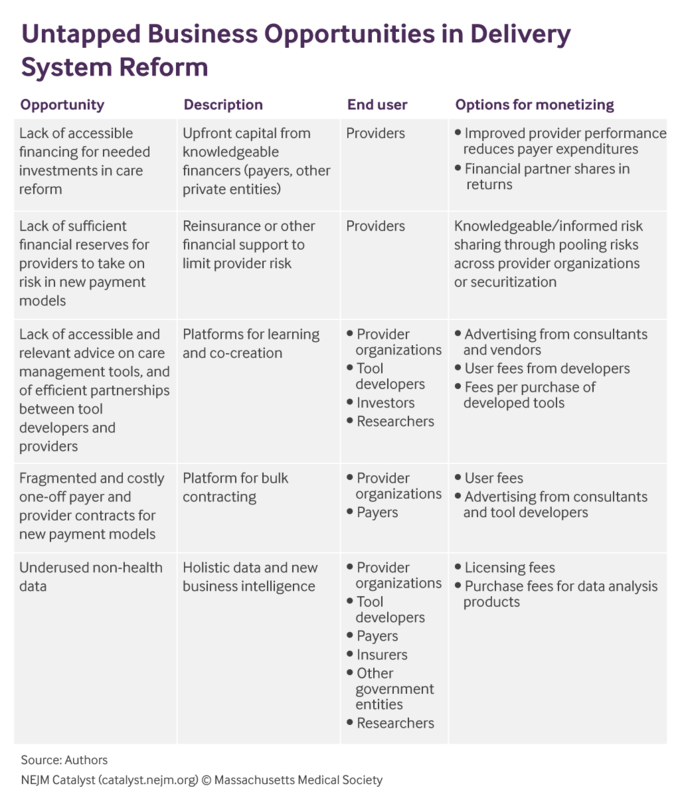 Article from NEJM on business opportunities popping up in health care reform. The chart below has some interesting ideas. Link. At the risk of being an Oscar fanboy, man they have some really good content they share. Here’s a blog post from Invision on Oscar’s app redesign. Lots of good takeaways here — from thinking about how to design an app that is not supposed to be used regularly, to limiting navigation options to try to limit people’s confusion, to redundancy. 23% of their users are using telemedicine through their app, which is really high. And it’s the simple things… like a virtual ID card, that can be the most beneficial for users. Link. Some research suggesting Twitter can predict flu outbreaks. Interesting, but skeptical of how this practically translates at this point. See also: Google Flu Trends. Link. Analysis of how drug prices rise over time in Medicare. Humira price increases in 2016 cost taxpayers an extra $223 million. Link. Reference pricing / balanced billing for pharma by an employer reduced spend by the employer by $1.34 million and increased copay costs by the employee by $0.12 million. Would be great to see the whole article if it wasn’t behind a paywall, but some interesting data. Seems like if you tied balance billing to known prices upfront it would be a whole lot more palatable than it currently is (where consumers are hit with unexpected bills because prices are unknown). Link.